Information Management is defined within the QGCIO glossary as "the means by which an organisation plans, collects, organises, governs, secures, uses, controls, disseminates, exchanges, maintains and disposes of its information; as well as any means through which the organisation ensures that the value of that information is identified and exploited to its fullest extent." The Information Management Policy Framework (IMPF) identifies and defines the various domains which contribute to effective information management across the Queensland Government. It is an organising framework for establishing a common viewpoint and shared understanding of the broad scope of information management activities undertaken. Additionally, it can be used as a tool to categorise information management activities which can then form the basis for undertaking gap analysis and discovering duplication. The IMPF has two levels of domains. Level 1 domains are high-level domains that cover all information management activities across Government. Each level 1 domain has one or more level 2 domains which are lower-level domains that define the specific elements of their parent domains. The level 1 domains of the Policy Framework are shown below. To learn more about the above domains please select here ..
What Information Management tools are there? 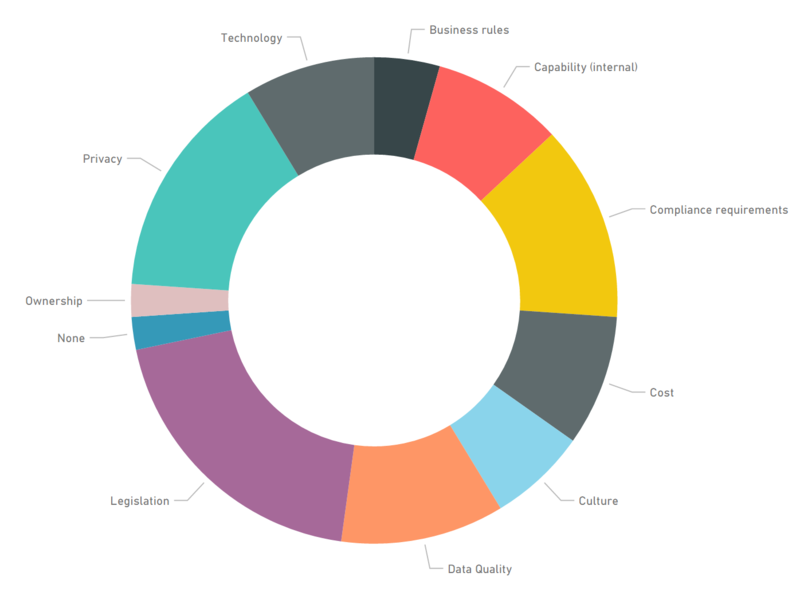 Through the ICT profiling program, QGCIO collects, analyses and leverages a broad range of Queensland Government ICT data for numerous insight and strategic objectives. For the 2016/2017 reporting year, the ICT profiling program included the collection of high-value information assets and services that support priority service delivery domains for Government. The 2017/2018 ICT resources profiling activity is currently underway across agencies. This collection has been expanded to include all Queensland Government information assets. Once collated and analysed, a catalogue of high-value information assets reported through this process will be published here. As a result of the above ICT Profiling program, there currently exists a register of the Information Assets collected by the ICT profiling activity from 2011 to 2017. The information asset collection process includes the important step of asset value determination. The model adopted by QGCIO is derived from Gartner's approach to measuring value of information assets (“Why and How to Measure the Value of Your Information Assets”, Gartner 2016) and incorporates the Australian Computer Society (ACS) Data Task-force's approach of making Gartner's valuation models more relevant to the public sector (Data Sharing Frameworks, pg 23, ACS Data Taskforce 2017). QGCIO selected a subset of the proposed value models and decided to target four dimensions of information value - business, policy, economic and research. The Queensland Government is a huge generator and consumer of data and information. Yet regularly, decision makers across all levels do not have access to all the requisite information they need when making crucial decisions – particularly if the information or data is located outside their line agency. Too often, access to crucial information and data is limited due to a misunderstanding of the risks and a lack of consideration on the overall value of sharing. The ISAF strives to ensure Queensland Government information is exchanged between parties without friction, while respecting the privacy rights of individuals and balancing risks and opportunities. The development of the ISAF was led by QGCIO, in conjunction with the vendor partner GWI, and supported by valued contributions from subject matter experts across Queensland Government. Each report makes recommendations to improve information sharing within their service delivery domain and positive tangible progress has been made on this across multiple fronts and in many service delivery areas (In fact, the Information Sharing Authorising Framework draws heavily on the work conducted by the 'Our Child' Information Sharing Solution established in response to the When a child is missing report). However, the need to improve information sharing process and practice more broadly across all service delivery domains still remains. Subsequently, the Information Sharing Sponsoring Group (a Directors-General ICT Council endorsed oversight sub-committee) approved the development of an authorising framework to provide clear guidance and structure for information sharing across broad range purposes and for use by a broad range of agencies. The framework is a group of modular components comprising mostly of process guidance, artefact templates and other relevant resources that assist in the establishment and subsequent management of an information sharing activity. For simplicity, these components are organised into four distinct phases which cover the life-cycle of an information sharing activity. The modular design of the framework allows sharing practitioners to easily select the right guidance or tools that best fit their individual circumstances and sharing objectives. A primary premise for the development of the framework was to change the nature of the information sharing conversations from being primarily about ascertaining and remediating risk (either real or perceived), to identifying and permitting information sharing opportunities to improve the business of Government. Each phase of the Framework has subordinated sub-phases. These sub-phases are comprised of a number of activities, with each activity producing or contributing to an enabling artefact. The Permitted Usage Conditions Model provides a standardised way to give clear and consistent permission on the use of any shared information in an activity. Empowering information custodians to define permitted uses of shared information through a standardised model guarantees clarity of intent and removes the risk of liability through misuse across the information value chain. The Escalation Pathway provides a short circuit mechanism to help a stalled information sharing agreement where one or multiple party members aren't able to agree on the sharing of information. The pathway allows for decision makers to be provided a full and comprehensive understanding of the risks and opportunities to make an informed decision on sharing. The diagram below shows all the comprising artefacts of the Information Sharing Authorising Framework. Each artefact is the result of one or more activities conducted across each phase of the Framework. Key enabling artefacts include the Master Sharing Agreement and the Information Exchange Schedule. 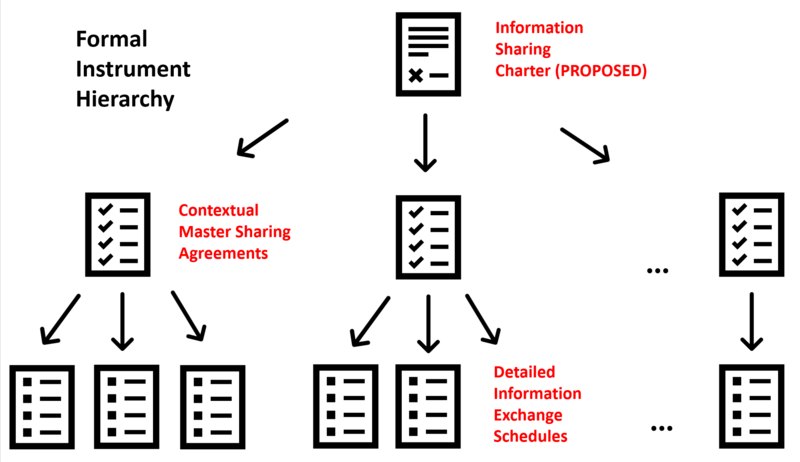 The framework includes a hierarchical set of formal agreement instruments that aim to provide consistent, structured and reusable authorisation pathway for all information sharing activities established by the Framework. These formal agreement instruments are outlined in the table below. Whole-of-Government executive agreement on core principles of information sharing which all government agencies strive to. Agency executive agreement for information sharing between all relevant parties for a broad context. Through wide consultation within the various agencies of the Queensland Government our team has been exposed to a number of sharing activities occurring within agencies. In our consultation with agencies we have started to record the details of these information sharing transactions, with particular focus on the barriers and enablers. As a result we have been able to start identifying recurring characteristics which, in combination with research findings, can be leveraged and reused to solve common information management and sharing problems - both across Queensland Government and with other jurisdictions. Developing a knowledge-base of key learnings for future information sharing initiatives. So what does the preliminary analysis indicate? The 'Lessons Learned' report, produced for the Queensland Government in 2015, also details many of the barriers and enablers that repeatedly occur when agencies attempt information sharing exercises. Many of the barriers and enablers outlined in this report still apply today and can be leveraged to promote a culture of sharing. We are always looking to learn more about what the barriers and enablers for information sharing activities in the public service area. If you are involved in an Information Sharing activity then we would love to hear from you. If you would like to get in contact, please contact the Information Strategy and Policy team via transformation@qgcio.qld.gov.au. We look forward to hearing your information sharing story! The Information sharing agreements register can be accessed by Queensland Government employees only. We are actively looking for further agreements to include in the register. If you have an agreement that you'd like to share please contact the Information Strategy and Policy team on the contact details below. To view all the Information Management related discussions currently up on the QGCIO discussion forum please view the Information Management category. This forum includes discussions on all upcoming changes to Information Management related policy and guidance.